In the midst of that chaos is my desk that I actually was working from each day. 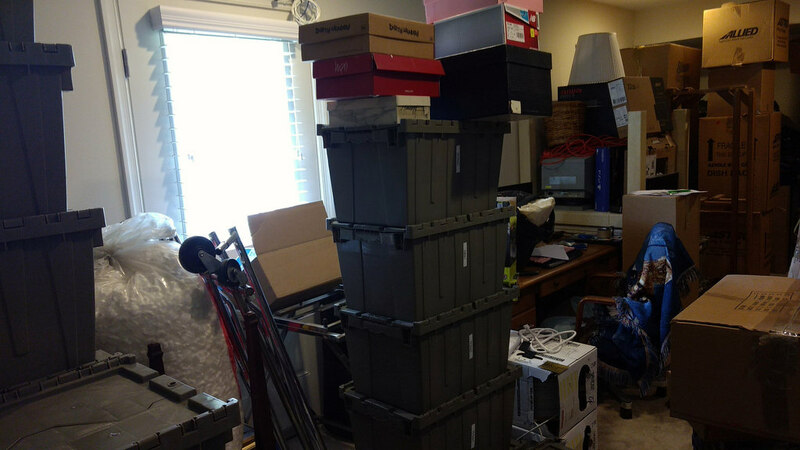 As I mentioned then, we spent the time we were in town last time to go through specific totes to pull out everything we wanted to leave at the townhouse, and prepare to ship everything else out west. As a second home, we’re keeping a very limited selection of things there, preferring to keep most at the house in California, or at least in storage we own nearby. This trip we just returned from was focused on getting the container loaded up to ship out to California. We had the container dropped off in our driveway on Saturday, the same day we got into town, had movers come on Monday to pack everything in, and then saw it off on Wednesday. With that, our major project of the week was complete, and the den that had been packed to the ceiling with stuff was suddenly available to fully use! No more work conference calls surrounded by boxes! 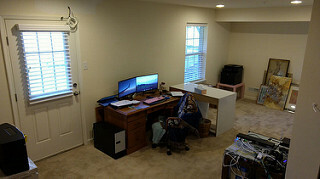 The room needs some work before it’s properly finished, but right now I’m just happy to have space available, and not to be stepping through a hallway of boxes to settle in to my desk for the day. It really was a lot of stuff, I was very happy when it fit inside the single container. We also included a mattress that had been in the guest room, which meant we needed to go shopping for a new one. We decided to go with a queen size so we only have queen size beds in Philadelphia. Some shuffling of sheets and comforters resulted as well. Finally, we ordered an actual bed for the guest room, which is a step above the basic metal frame we had in there previously. The bed is scheduled for delivery and assembly when I’m in town again at the end of the month. I also met with a couple gardeners to see if they could help with our small plot outside, as my current condition and then arrival of the little one next year will impact our ability to do it ourselves for a while. Fingers crossed that something positive comes from that. I am relieved to have the big container project behind us. There is the matter of unpacking in California, but I that’s a future problem and not one I had to worry about last week. There is still have a bit of work to do at the townhouse, including painting the walls, but we’re slowly getting there and though we kept busy all week, it was relaxing for me to get the big project out of the way early in the trip rather than having it drag on until we had a flight to catch. There weren’t any grand adventures this visit, but the visit did allow me to have meals with a couple of my local friends, including Crissi who I hadn’t seen since last year, and a couple meals with family. The only day I took off was from work Monday for the move and cleanup, so the rest of my week was pretty much spent on work. It was nice to settle into a bit of a normal routine there and get to appreciate it at a home instead of a project that needs constant attending to. I was able to find some time to finish a book and watch a bit of TV one night when we ordered in pizza. It was a good week. This entry was posted on Monday, August 6th, 2018 at 8:27 am and is filed under philadelphia. You can follow any responses to this entry through the RSS 2.0 feed. Both comments and pings are currently closed.